Who wouldn't want unlimited vacation time? Here are a few advantages, as well as pitfalls. Who wouldn't want unlimited vacation? Employees like it because they gain more time to relax and can come back to the office refreshed and ready to work. Employers, like you, can benefit, too. 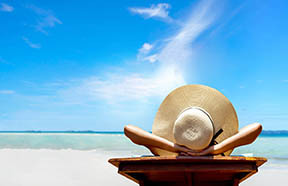 Oftentimes you can save money by not paying employees for unused vacation days. The Financial Times reported in 2017 that a big firm can save millions of dollars’ in unused leave it otherwise would pay to departing employees. Some companies — particularly start-ups, tech companies or nonprofits — offer unlimited vacation to entice talented job candidates or offset low salaries. It's also considered a perk for executive-level or exempt employees. The benefit cannot be offered to nonexempt employees, though, because their paid time is governed by wage and hour laws. Of course, as with any great idea, there are pitfalls. Here are downsides you should know if you decide to offer unlimited vacation to your employees. One problem with offering unlimited vacation is employees often take less time off than employees who have a set number of vacation days. One reason is that many companies have a "use it or lose it" policy which encourages employees to use time off. The 2017 HR Mythbusters report by HR software company Namely found that employees who were eligible for unlimited vacation took off an average 13 days a year, while those with capped vacation days took about 15 days off. Many employees with unlimited time off felt guilty taking a vacation, particularly if they worked for a company with a workaholic culture. Another negative consequence is that some states, such as Illinois, require employers to log employees' work hours as well as vacation or paid time off (PTO) accruals and usage. Companies that don't keep track of days off may argue that the state requirement doesn't apply since employees cannot accrue guaranteed vacation time. The Illinois Department of Labor disagrees. The Department says all employers "must pay an employee who separates from employment a monetary equivalent equal to the amount of vacation pay to which the employee would otherwise have been allowed to take during that year but had not taken." With unlimited vacation, how would employers know how many days the employee meant to take, but didn't? Should employers take employees' word or use an average of the days used by all employees or by specific employees? It can get complicated. Unlimited vacation and PTO policies also create issues when trying to follow Family and Medical Leave Act (FMLA) rules. Federal law requires that employers allow available paid leave to run concurrently with an employees' FMLA leave. If a policy simply provides for unlimited PTO, with no cap, that might mean that an employee's entire 12-week FMLA leave must be paid. But, with a time off cap, paid leave would be limited to the time the employee had not yet used. Talk to your legal counsel about managing the transition from fixed PTO in a way that does not violate your state and local wage laws. For example, if you are in a jurisdiction requiring you to provide a certain number of days of paid sick leave, consider adding language to your policy to make it clear that employees will be provided with the required number of paid sick days. Make sure the new rules also coordinate with paid parental leave or short-term disability policies. Establish rules to ensure that unlimited vacation doesn’t hurt your company’s operation. For instance, you can limit consecutive days off or require employees to get management approval for time off. Even though you offer unlimited time off, you should continue to monitor your employees' vacation and sick days and their reasons for absences. You will be in compliance if your state requires it, moreover you will also have information you may need to defend yourself against certain claims. Regularly review and update your policy to ensure you stay up to date with changes in the law. The information presented and conclusions within are based upon our best judgment and analysis. It is not guaranteed information and does not necessarily reflect all available data. Web addresses are current at time of publication but subject to change. SmartsPro Marketing and The Insurance 411 do not engage in the solicitation, sale or management of securities or investments, nor does it make any recommendations on securities or investments. This material may not be quoted or reproduced in any form without publisher's permission. All rights reserved. ©2019 The Insurance 411. http://theinsurance411.com Tel. 877-762-7877.